We live by the water on Refshaleøen in Copenhagen, in what used to be the offices of Burmeister & Wain (B&W). We like it here in this former shipyard, which is also home to a variety of businesses, be it design, film production, art, architecture or start-ups. In 2013, Architect and Blacksmith Jesper Rølund was contacted by ASKO, Norway’s biggest food and retail distributor. 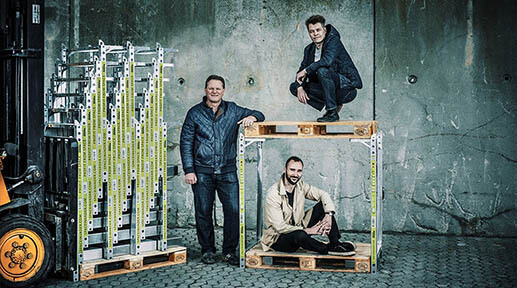 They were looking for ways to improve their handling of goods during transport, and asked Jesper to develop a concept that would make it possible to increase the capacity of their trucks. With his background in design and manufacturing, Jesper built the first SpaceInvader prototype. 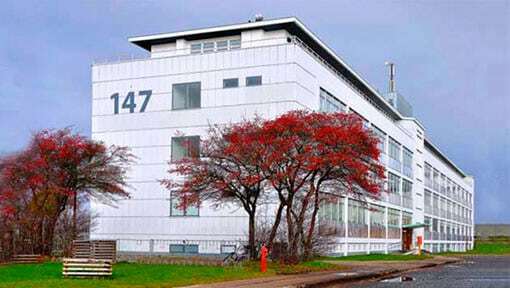 At DTU Scion, a network for entrepreneurs, Jesper linked up with Steen Frederiksen and Mads Klie-Holde, and together they founded SpaceInvader in 2015. Together, they form a team with a thorough knowledge of working in the energy- and transportation sectors, and have decades of experience working with project management, design, and executive management. The three founders have since continued to refine the initial prototype, and today, SpaceInvader is a ground breaking and patented concept with potential to revolutionise the transportation industry. SpaceInvader will streamline transport and storage down to every single pallet, thereby creating a more sustainable transportation industry for the benefit of customers, businesses, the environment, and society as a whole. The SpaceInvader system will introduce a new standard for the stacking of pallets, and will change road transport the same way the shipping container changed the shipping industry.